Sleek is one of my favorite brand when it comes to blushes! I do own quite a lot of their blushes and not one of them has ever disappointed me! That says a lot! Retailing at 6$ for 8g of product Sleek blushes come in variety of range, I believe they have total of 10 blushes in their permanent collection and Pixie Pink is one of them! The formula of the blush is perfect, satiny smooth and blends like a dream! The pigmentation is good and one swipe of brush is enough to get pinched cheeks! Its not extremely pigmented like some other blushes from their range so chances of going overboard are pretty less with one swipe. The staying power again is amazing! Even in this hot and humid climate it stays well for 6 to 7 hours after which I do notice slight fading. The best part it doesn't get blotchy or patchy and stays put! The shade is so pretty pink and in my opinion a must have! 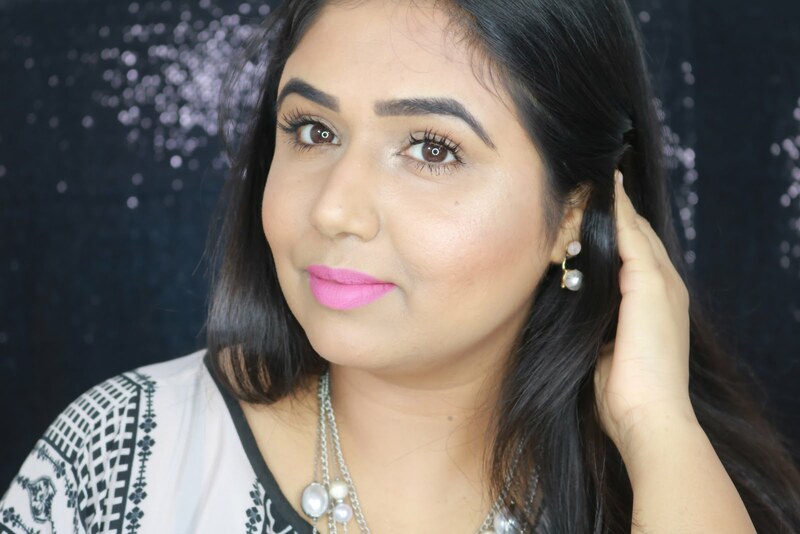 It will suit all skin tones especially our indian skin tones since we have quite a lot of yellow in our skin and this hot pink blush gives a nice glow to the skin! Its absolutely matte so will suit all skin types beautifully. The packaging is good, comes in sleek black packaging with a big mirror. The only problem with this packaging is sometimes I struggle to open the compact and fear that while opening I may destroy the blush! Again this is not consistent with all their blush packaging! Sleek if you are reading please change it! -> Availability is restricted to UK and online. I highly recommend this blush to everyone! Its definitely a must have in your kitty if you love pinks! ive been thinking of placing my first sleek order since long, but ive never done international online shopping! sleek is safe na? You should definitely give Sleek Makeup a shot..their eyeshadow palettes and blushes are a must have! Wow you look gorgeous Parita!! :) wanna order Sleek stuff soon.. hope i get my hands on them soon.